At Three Point we use a diverse range of manufacturing techniques and materials to create inspirational ideas with simple and achievable solutions. Understanding a brands purpose and value is key to providing vision and personality to any environment and we ensure that we get to know a brand thoroughly, the people behind a project and the target audience. Personal contact means a lot in our business, which is why we ensure regular and effective communication through project updates and face-to-face account management, this ensures that every aspect of any project is managed efficiently at all stages. From the initial briefing stage, through design, costing and production, you will find our enthusiastic and tailored approach gives you complete confidence in our professionalism and capabilities. 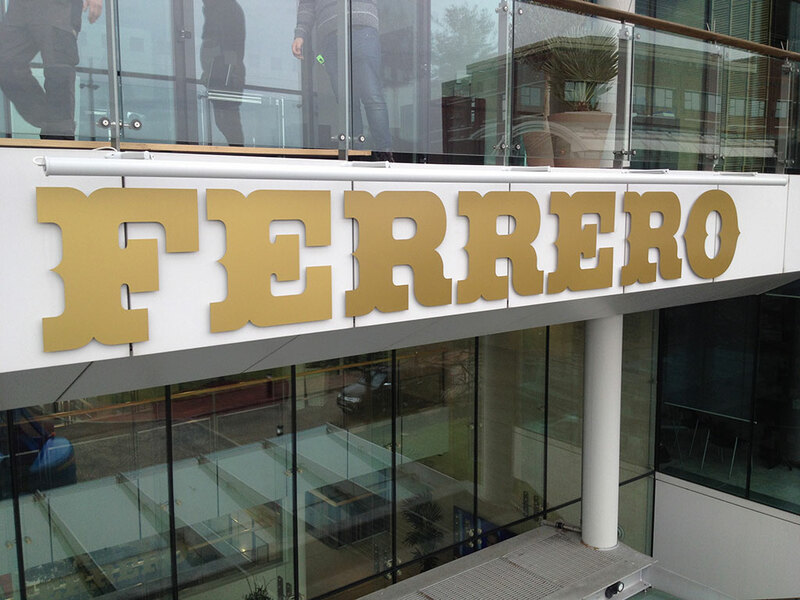 Three Point were invited to survey every office and meeting room within Ferrero’s new HQ over 5 floors. Ferrero then commissioned Three Point to produce, supply and install all indoor and outdoor illuminated building and gatehouse signage, flagpoles and general signage. Dramatic reception lighting was created with gold letters affixed direct to the main structure, then washed with a white light. Two mock shops (convenience and superstore) were also designed and installed on site complete with dummy tills, coffee machines, ATM, and produce so that Ferrero could research and test their products, packaging and POS in a retail environment before committing it to the high street. All works were prepared off-site and then installed over a weekend to minimise client disruption. Three Point created a real herringbone style floor to fit over an existing base on site within Harrods, this was designed to lock together without any witness lines achieving a high class and bespoke finish worthy of a traditional cabinet maker. Brackets were then developed to carry the weight of large picture frames which would hook over an existing wall on site, yet appear virtually invisible. These picture frames housed SLA footballs, 3D spiders and boots, these were applied to existing frames, then sprayed gold. Display podiums were produced using a special material mix to give a real ‘concrete’ effect, yet remained lightweight and manoeuvrable. An incredible 9 coats of paint were used to create the desired drip effect. The entire site was fitted overnight outside of trading hours. 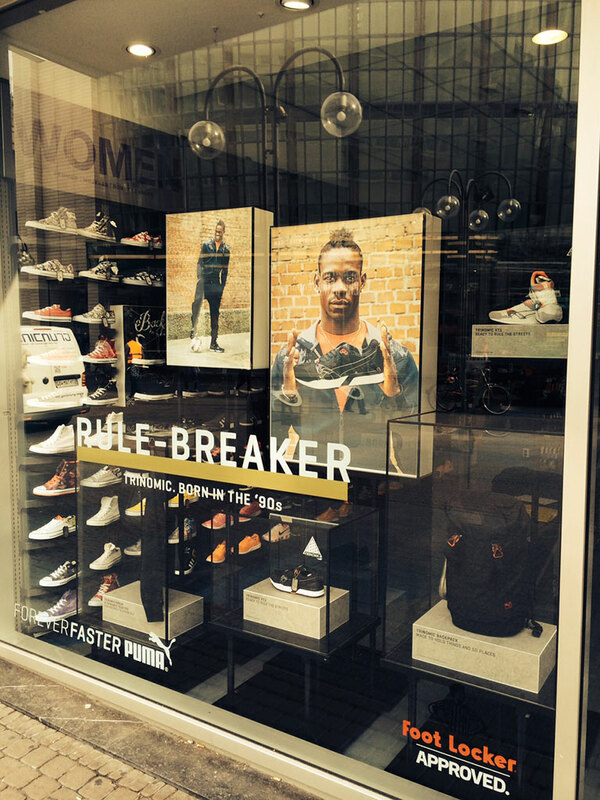 Bespoke lightboxes and product cases were designed, developed and manufactured by Three Point to dress Footlocker Store Windows on behalf of Puma. A solution using different sizes units with modular fixings were produced giving a diverse range of display combinations to suit 17 different sized stores. 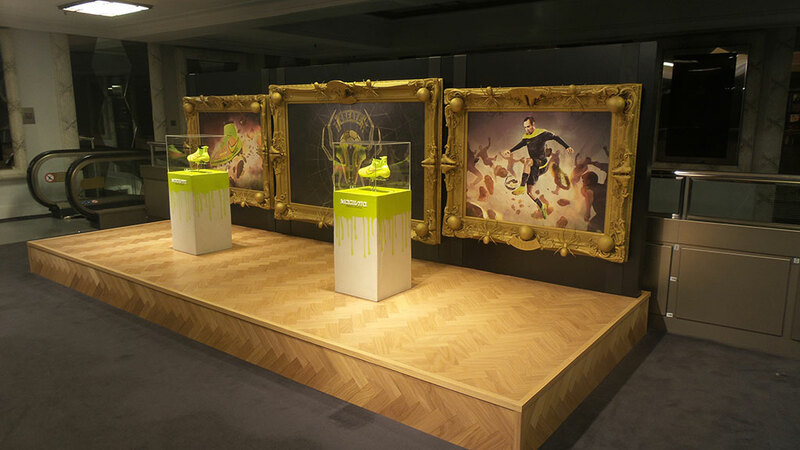 Installations were carried out at 42 stores, across 7 countries, during 1 evening, allowing Puma’s new products to be launched simultaneously with a global impact. Tasked with creating an infinity mirror effect display cube, Three Point invested time and energy into an innovative solution never seen before in retail display. The cubes contained numerous panels, all printed to an exact individual specification and each internal wall incorporated LED lighting fitted to ‘bounce’ light all around the cube. Final production units were positioned on store table tops, giving a genuinely intriguing visual appearance which augmented the new Nike Photosynthesis product launch.